This gulf front studio offers a king size bed with two recliners and a private balcony directly overlooking the Gulf of Mexico. Amenities include WIFI, HD TV and DVD player, iron, clock radio and hair dryer. Each unit offers a fully appointed kitchen with full size refrigerator, stove with oven, microwave and coffee maker. This gulf front studio offers two queen size beds with two recliners and a private balcony directly overlooking the Gulf of Mexico. Amenities include WIFI, HD TV and DVD player, iron, clock radio and hair dryer. These spacious gulf front queen studios offer especially large accommodations with 500 sq ft of living space. This room type offers two queen sized beds, a large dining table and a large private balcony directly overlooking the Gulf of Mexico. 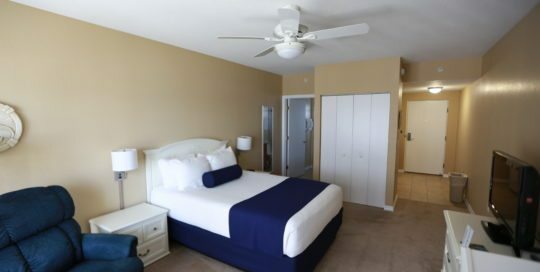 This handicapped accessible poolside gulf view studio offers a king size bed, one lazy boy recliner and a private balcony directly overlooking the pool and the Gulf of Mexico. This poolside gulf view studio offers a king size bed, two lazy boy recliners and a private balcony directly overlooking the pool and the Gulf of Mexico. The bathroom offers the option between a tub or stand-up shower. This poolside gulf view studio offers a queen size bed, two lazy boy recliners and a private balcony overlooking the pool and the Gulf of Mexico. The bathroom offers the option between a tub or stand-up shower. This poolside gulf view studio offers a queen size bed, two lazy boy recliners and a private balcony with a limited view of the patio and the Gulf of Mexico. The bathroom offers the option between a tub or stand-up shower.